On March 11, 2016 at 3:00 P.M. FLAVORx Inc., a Maryland-based provider of medication adherence solutions, and Fillmaster Systems, makers of innovative pharmaceutical reconstitution equipment, will unveil the jointly developed FlavorMaster®, a new piece of pharmacy automation equipment. The device is the first fully-automated reconstitution and flavoring device, designed to save pharmacies time and improve dispensing accuracy behind the counter. Maryland’s Secretary of Commerce, Mike Gill and members of the Maryland Department of Commerce’s Office of Biohealth Technology will be on hand to help unveil this new technology. The idea to help children take their medication by improving the taste started in a small independent pharmacy in Washington, D.C.. A pharmacist wanted to help his infant grand-daughter, who suffered from epilepsy and struggled swallowing her medicine, get better. By developing a customized, personal flavor for her, the young child took her anti-seizure medicine without a problem and the idea to help other children in need began. The small biotech business, now known as FLAVORx, is currently available in 45,000 pharmacies across the nation and gives pharmacists and pharmacy technicians the ability to custom-flavor over 600 liquid prescription and over-the-counter medications. 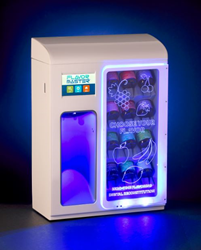 The new FlavorMaster combines Fillmaster’s automated water dispensing technology with FLAVORx’s proven medication adherence boosting flavors, into a cutting edge piece of pharmacy technology. Pharmaceutical reconstitution, which in many pharmacies is still a manual, inefficient, error-prone process, is accomplished at the push of a button with the FlavorMaster. The entire process of filling and flavoring a liquid medication is accomplished in a matter of seconds. “With the FlavorMaster, pharmacies have the power to boost pediatric adherence and improve a child’s health outcome”, said Amos. “This is the solution our pharmacy partners have been asking for. We are excited to finally be able to share this tremendous new technology with our existing and prospective customers. And we’re proud to bring such innovation to market as a Maryland-based small business worldwide”. FLAVORx, a provider of medication adherence solutions, has been making medicine-time easier for children since 1994. Using FLAVORx's copyrighted flavoring recipes, pharmacists have safely flavored more than 65 million prescriptions and over-the-counter medications, allowing children to take control of their illness and recover more quickly by staying more adherent to their medication. The company's mission is to improve lives and health-related outcomes through higher medication adherence.